California’s Central Coast is full of beauty. Splashing and crashing back and forth, waves wear down rock formations along waterlines. Pelicans fly low, their wings still, gliding gracefully in line. Silvery morning light reflects off the back bay, illuminating the undersides of leaves and glowing through fog. 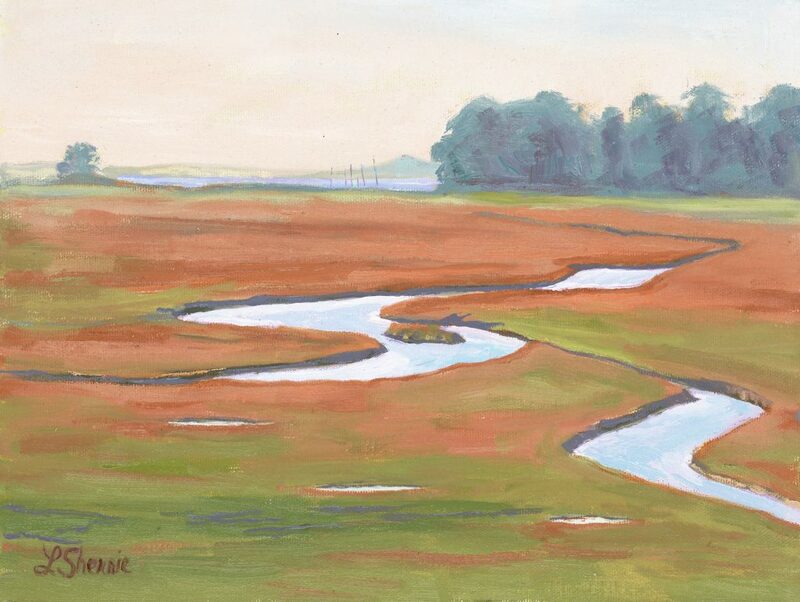 The estuary channels snake through the salt marsh, appearing deep brown at low tide and shining white or blue when the water is high. The fiery red tips of pickleweed plants contrast with the cool green that surrounds them. S.L.O.P.E. artist Tracy Paz captures the path of an estuary channel through the pickleweed in her painting, October Estuary. A group of local artists called San Luis Outdoor Painters for the Environment (S.L.O.P.E.) have drawn inspiration from this wealth of natural beauty for an art show that celebrates the Morro Bay estuary and the Central Coast. 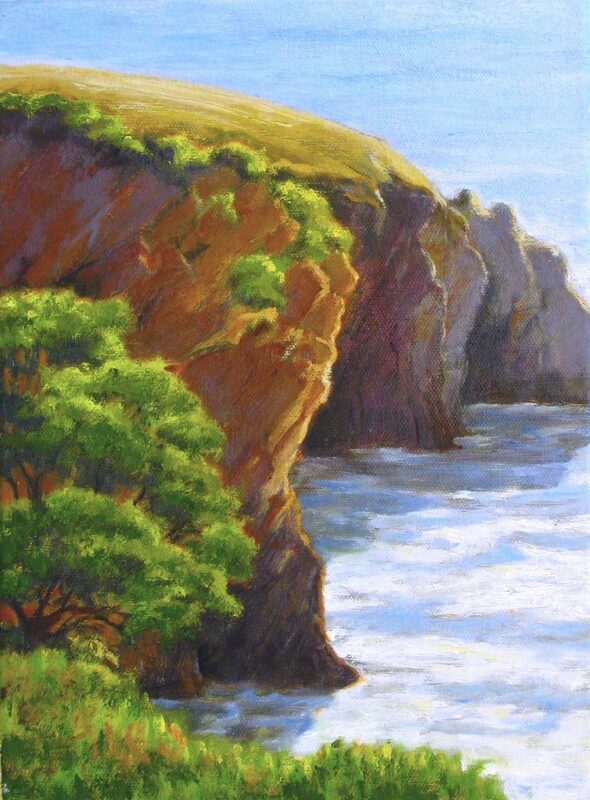 Artists could choose to paint any coastal or estuary scene between Ragged Point in the north to Oso Flaco in the south. The paintings they have created are just as varied as that long expanse of coastline. 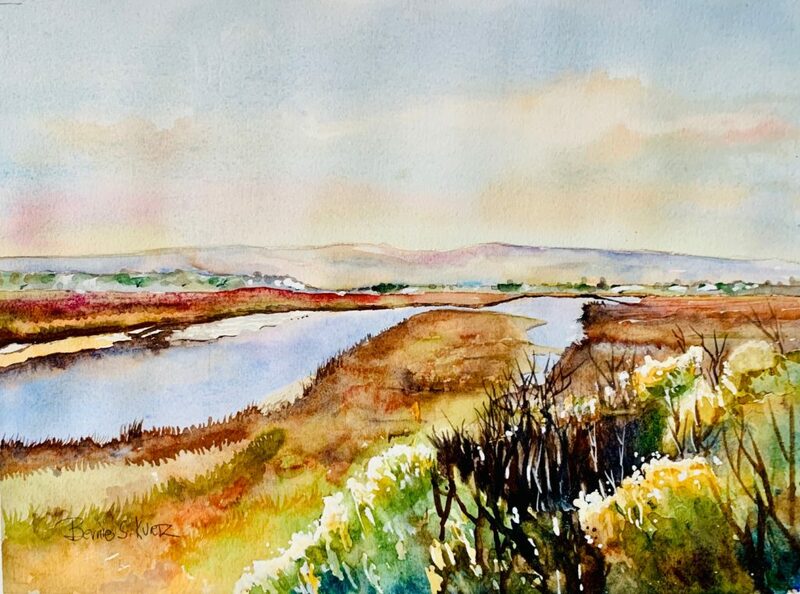 Bernie Kurtz’s painting, Morro Bay Estuary, was inspired by the view of the sun reflecting off the water from the corner of Main St. and South Bay Boulevard in Morro Bay. Dottie Hawthorne, a guest emeritus artist with S.L.O.P.E., stopped one morning to paint the way the light fell on the Shell Beach Cliffs and the shadows that the rocks cast onto the water. Her creation is called Coastal Cliffs Morning. The light and shadows falling on the rocks and water along the cliffs of Shell Beach inspired Dottie Hawthorne to stop and paint. She calls the finished piece Coastal Cliffs Morning. When Laurel Sherrie caught a glimpse of “the late afternoon light with high tide and the trees in the distance,” she loved it and knew she had to paint it. Estuary Prelude captures this moment. Laurel Sherrie’s painting, Estuary Prelude, captures the view from the trail near Park Ridge Rock in Morro Bay in the late afternoon light. High tide and green trees are visible in the distance. 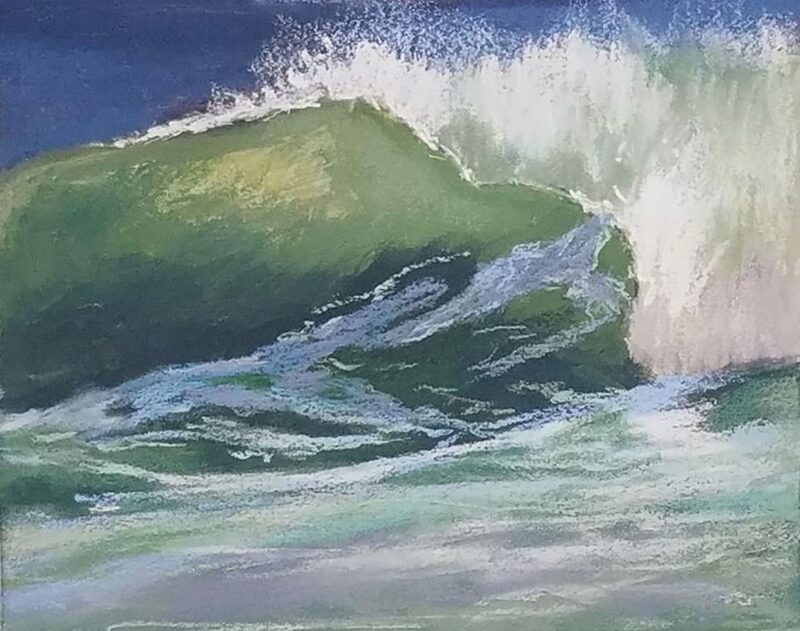 Sundance, a painting by Denise Schryver, captures the power of an ocean wave. Painted at the dog beach between Cayucos and Morro Bay. S.L.O.P.E. artists are generously giving back to the places that have inspired their creativity by donating a portion of proceeds from sales at the art show to the Central Coast State Parks Association (CCSPA) and the Morro Bay National Estuary Program. 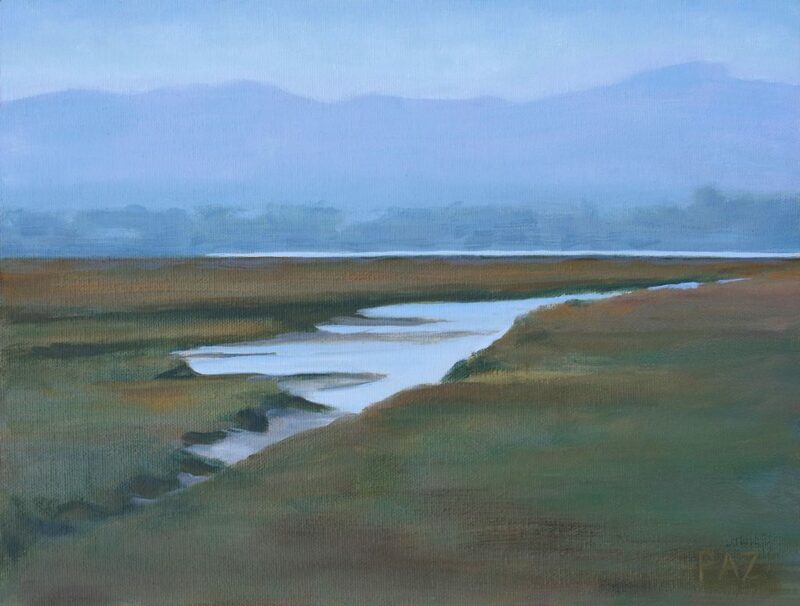 Artist Tracy Paz has also donated a print of her painting, October Estuary (pictured at the top of this post), to be given to the winner of a drawing. Tickets are available for a suggested donation of $5.00, and S.L.O.P.E. will give all donations they collect to the CCSPA and the Estuary Program. The show, Flowing Estuary to Living Sea, will hang at the Morro Bay State Park Natural History Museum between February 1 and March 31, 2019. An opening reception will be held on Saturday, February 2, from 1:00 to 4:00 p.m. We hope to see you there! Donate to the Estuary Program today and support our work in the field, the lab, and beyond. The Estuary Program is a 501(c)3 nonprofit. We depend on funding from grants and generous donors to continue our work. Support us by purchasing estuary-themed gear from ESTERO. This locally owned and operated company donates 20% of proceeds from its Estuary clothing line to the Estuary Program. 100% of Estuary decals support us, too! Thank you, ESTERO!